Clipboard Switcher enables you to define any number of named clipboards which can be use to Cut or Copy into and Paste from in any application. To use Clipboard Switcher you simply trigger the Clipboard Switcher macro. 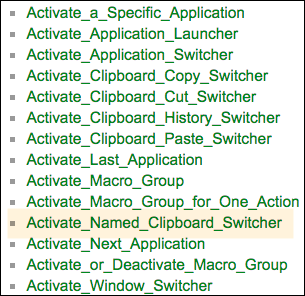 I cannot find any KM Action named "Activate Named Clipboard Switcher"
Nowhere in the Switchers group is "Named Clipborad mentioned. which doesn't seem to exist? The Named Clipboards predate the clipboard history. Presumably you know that Named Clipboards are like variables for clipboard entries and you can create them in the Clipboards preferences (or in other ways). The Named Clipboard Switcher is like the Clipboard History Switcher, but for Named Clipboards. It has three variants for Cut/Copy/Paste, which just define what happens when you double click on an entry - when you are in the switcher and double click, Keyboard Maestro will copy or cut, and then put the system clipboard into the entry, or paste the entry depending on the variant. The Named does not appear in the actions because it doesn’t fit and as I say, predates the clipboard history. It’s not the best UI, but that is what it is currently. Peter, I think you missed my main point: I do NOT see an Action in the KM app for “Named Clipboard Switcher”. 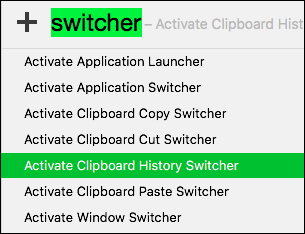 Activate Clipboard Cut/Copy/Paste Switcher is Activate Named Clipboard Switcher (three variants depending on what double click in the Named Clipboard Switcher does). The Clipboard Switcher is the Named Clipboard Switcher. It was named before there was a History Clipboard Switcher to differentiate from. Peter, I must be brain dead, because this is confusing as h*ll. But I think I may have finally figured this out. “Clipboard Copy Switcher” COPIES the current selection to the Named Clipboard selected in the switcher. “Clipboard Cut Switcher” CUTS the current selection to the Named Clipboard selected in the switcher. “Clipboard Paste Switcher” PASTES the contents of the Named Clipboard selected in the switcher. Let me again state, for clarity, that nowhere in the KM Editor/App do I find anything with “Named Clipboard Switcher”. Actually, the “Clipboard History Switcher” pastes the current/prior items of the System Clipboard analogous to the “Clipboard Paste Switcher” that uses Named Clipboards. "Clipboard History Switcher" to visually allow the user to paste from a selected past clipboard. 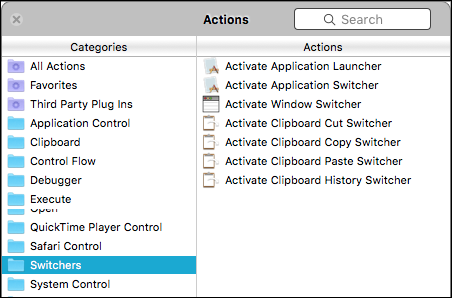 Remove “Activate Named Clipboard Switcher” from the Action list, and all other references. In the Wiki article (#2), clarify that the Actions don’t actually contain the " (Named)" term, but that all of them only use Named Clipboards. It would be best to rename the actual KM Actions to add the “Named” term, but I guess that might break some existing macros? If you happen to be following this thread, please help us out here by posting your thoughts on what is clear, and what is not. If you have any ideas/suggestions on how to improve the clarity, please feel free to post. Well, more or less, yes, it’s one switcher with three variants (shown by the buttons across the top). Yes, it is abbreviated to just Clipboard Switcher. The title of the window will be Named Clipboard Switcher - Cut/Copy/Paste in the next version. Currently the action names remain unchanged because those longer ones would not fit. Right. And the latter predates the former, which is why it is called “Clipboard Switcher” rather than more completely “Named Clipboard Switcher” - there was no need for the qualification before the clipboard history was added. In addition, KM provides the Action “Set Clipboard to Past Clipboard” and the “Clipboard History Switcher” to visually allow the user to paste from a selected past clipboard. Right, and there was Set Clipboard to Named Clipboard, but that has been subsumed by the Copy Clipboard action which lets you copy a clipboard from the system or named to the system or a named clipboard. That would be unwise based on future direction. Keyboard Maestro 8 will make some of this clearer and will reduce the use of “Clipboard Switcher” without qualification. That would break the Help for the actions unless you include redirects for each of them, in which case it will complicate the Actions page. The actions may actually change to be more complete in 8. I wouldn’t suggest messing around with them at this point. No, action names are not stored in the macros. Only internal codes are stored in the macros. They may be adjusted for 8. It can affect the help system, although there are redirection possibilities before it gets to the wiki. There are three clipboard switchers, ALL of which use "Named Clipboards"
Well, more or less, yes, it's one switcher with three variants (shown by the buttons across the top). I think that is an implementation detail that is lost on most users. From the perspective of most users, you show us 3 Actions with 3 different names. I'm realing that use of the term "switcher" is confusing. What is being switched? It is not like the app switcher, which clearly switches the frontmost app. Perhaps a more appropriate name would be "Named Clipboard Manager". All of these are hard to see. Most apps don't even show buttons for these common actions. These are the only two apps I have that show these buttons. Tex-Edit Plus and MS Word are very consistent. I really like the Word buttons. Very clear and easy to see. Have just one Action: "Activate Named Clipboard Manager"
Copy and Cut buttons would be disabled if there is no user selection. Default button/action would be Paste. The active button would be highlighted. Well, that will be confusing if the Action names and the window name are different. Again, I'd suggest a name of "Named Clipboard Manager", with only one Action. Similarly, you could rename the "Clipboard History Switcher" to "Clipboard Manager", or even "System Clipboard Manager". That would be unwise based on future direction. Keyboard Maestro 8 will make some of this clearer and will reduce the use of "Clipboard Switcher" without qualification. Unless you plan to release KM 8 very soon, IMO the Wiki needs to be updated to clarify current usage. It is very confusing to me as it is currently written. No wonder I can get simple copy and paste to work. This is very convoluted. I'll have to read it a few times.